Our professional teams of window cleaners are capable of meeting all commercial window cleaning requirements with ease. Utilising water fed poles and pure water technology our cleaning systems are environmentally friendly; we undertake internal and external window cleaning for our commercial clients. Specialising in "reach and wash" cleaning methods with hot water system for improved results. It might seem obvious, but when working inside busy commercial properties, whether it's an office, factory, or warehouse, all sorts of hazards, people, and equipment need to be carefully considered, especially when none of them mix well with water. We have recently invested in the Thermopure™ System; a new technology that uses heated ultra pure water. The water is less dense and absorbs dirt more readily giving a better finish. We also use Dragonfly internal cleaning technology. This has simplified internal window cleaning and in most cases eliminates the need for special access equipment. That's where we can make a real difference with the care and attention to detail that we bring to every job. 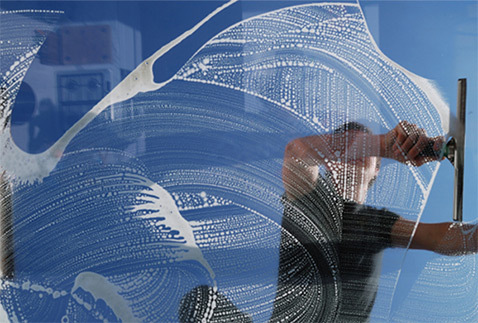 All operatives are trained and qualified ensuring high quality, time efficient window cleaning services.